May 6, 2014 - Kane Is Able, Inc., is proud to support the 22nd annual "Stamp Out Hunger National Food Drive" on Saturday, May 10, 2014. Postal carriers in more than 10,000 communities across the country will collect non-perishable food donations for community food banks and shelters. The event is sponsored by the National Association of Letter Carriers. More than 50 million people facing hunger every day in America, including nearly 17 million children. Food banks and shelters usually benefit from an upswing in charitable donations during the winter holiday season, however, their stocks tend to dwindle to critically low levels by springtime. The "Stamp Out Hunger," the largest one-day food drive in the nation, is a powerful way to refill those pantries. To donate, just place a box or can of non-perishable food next to your mailbox before your letter carrier delivers mail on May 10. Please donate items that have a current sell-by date, and do not require refrigeration, such as canned meats, fish, soup, bottled juice, fruits, vegetables, pasta, cereal, and rice. The carrier will do the rest. The food is sorted, and delivered to a local food bank or pantry, where it is available for needy families. KANE is encouraging its more than 1,100 associates across the country to support the event. Locally, KANE is donating a trailer to collect food at the post office in Clarks Summit, Pennsylvania. The following week, a KANE driver will deliver the trailer to St. Thomas Aquinas Catholic Church in Archbald where a group than volunteers will move the items to the Christ the King Food Pantry. 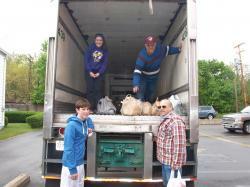 The food pantry serves approximately 50 families per month in Clarks Summit and the Mid-Valley.